As your child begins to quickly realize that “culture” is more than just the food, buildings and art of a country, but it is something that will directly impact their day to day life, they start going through the stages of culture adjustment. 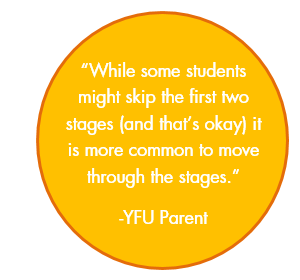 Extensive research has been done on cross-cultural adjustment, resulting in a recognized cycle of adjustment which YFU students will experience. Being aware of this cycle may help you understand what your child is experiencing, and thus ultimately support them in a helpful manner. Not everyone experiences all of the stages nor do they occur in any set order.Also, you might be surprised to know that your own family will also go through an cycle of adjustment without your child living at home for an extended period of time. The first two stages of cultural adjustment are (1) the Honeymoon Stage and (2) Settling In Stage. Both are pretty self-explanatory, but it is important for you to know that around the corner is stage three. Your family is likely to feel the difference in your household a lot sooner, and jump to more of a shock adjustment process. Your family might feel as if your child or sibling has forgotten about home. The name “shock” is a misnomer, in reality cultural shock builds up over time. This is a stage of fatigue and frustration related to cultural differences reflected as homesickness. This is very normal. Sometimes there is a rejection of the culture (“The way we do it in my country is better”), isolation from the host culture, more seeking out of friends of the same nationality, and the “I’m tired of trying” mentality. Culture shock is a normal psychological reaction that nearly all international travelers go through - some in mild or others in extreme form. Symptoms can include depression, difficulty sleeping, homesickness, trouble concentrating, an urge to isolate oneself, loss of appetite, and irritation with the host culture. Moving beyond this stage is dependent on them (on their choices) no matter how much you, as parents, want to fix the problem. At National Pre-Departure Orientation we will be discussing the many choices and efforts they can make to get over culture shock. Encourage them by asking what they think they can do. During these three stages, it is important to remember that as parents you are also a product of your cultures. As your teenager is experiencing another culture, you are too, through your child’s lenses. You may learn that they no longer have a curfew, they take public transportation all the time, they eat dinner at 8pm at night, or they spend all their money on coffee. This may not sit well with you, but it’s important to allow them toadjust to those cultural expectations, listen to their host parents, follow host family rules and feel comfortable without being judged. Remember that you have taught them values and what is important. Your teenager will be experiencing a dramatic move and an adjustment process that is actually fairly predictable: The excitement of arriving will wear off and life in a different country will become more routine. Learning to speak the language more fluently and making friends will demand a lot of your teenager. Don't expect every moment to be happy or pleas­ant, but be confident that your son or daughter will manage to get along in the new and different environment. A good way to work through your and your child's emotions is to understand one another's feelings and expectations before the exchange. Discussing in advance ways to handle moments of homesickness and how you might impact (reduce or reinforce) their experience. What are your expectations for Communication with your teenager while they are overseas? How will this help your child adjust? How will this help you adjust? Not everyone experiences all of the stages nor do they occur in any set order. Also, you might be surprised to know that your own family will also go through an cycle of adjustment without your child living at home for an extended period of time. During these three stages, it is important to remember that as parents you are also a product of your cultures. As your teenager is experiencing another culture, you are too, through your child’s lenses. You may learn that they no longer have a curfew, they take public transportation all the time, they eat dinner at 8pm at night, or they spend all their money on coffee. This may not sit well with you, but it’s important to allow them to adjust to those cultural expectations, listen to their host parents, follow host family rules and feel comfortable without being judged. Remember that you have taught them values and what is important.